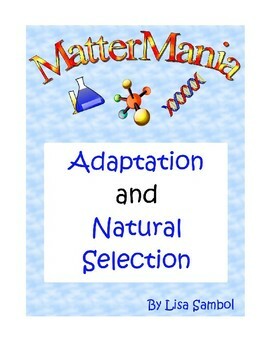 11 pages including a scripted lesson plan, interactive class experiments, and projects to introduce students to the ideas of adaptation and natural selection. They will learn how while people use tools and technology, animals are more dependent on their bodies. Through an interactive simulation, they will see how the same group might change over time in different environments. The class finishes with making a bird feeder for home or the classroom. Welcome to the world of MatterMania! I hope you enjoy my lesson plans for fun, interactive, and stimulating science classes. My lessons encourage the STEM fundamentals: becoming critical thinkers and effective problem solvers through real world examples and project based learning. 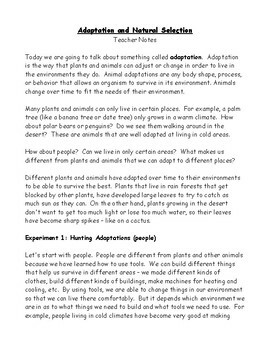 This lesson plan is appropriate for grades 2 – 5. 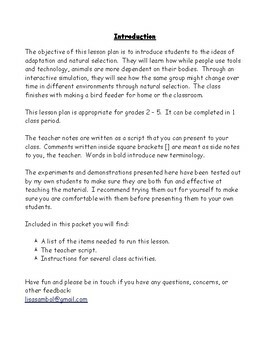 This lesson plan can be completed in 1 class period. 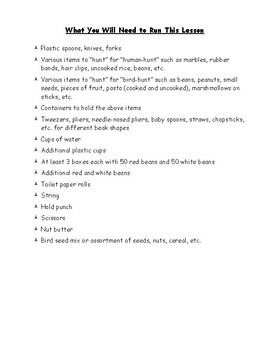 A list of the items needed to run this lesson. Instructions for several experiments and class activities. You might also like"An Introduction to Genetics."